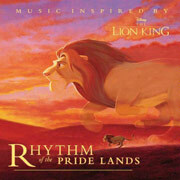 Collected herein are eleven songs that expand and mature the Lion King musical landscape. The African influence on the Lion King soundtrack is magnified tenfold here. Most songs are sung in African languages (one is a capella), some are sung in English and some are a mixture of both languages. The music itself is Afro-centric with a bit of pop tossed in. Two of the songs use the score of the film as a jumping off point and two others re-imagine songs from the film. The total effect is soulful, joyful and full of discovery. Young children might not appreciate it as much as adults, but the more you listen the deeper the songs affect you.